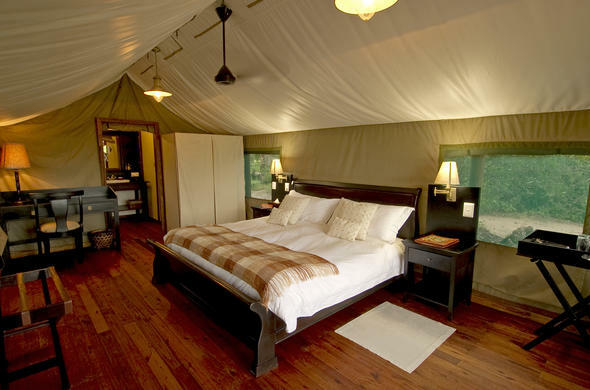 Stanley's a small luxury camp consisting of 8 classic styled safari tents. The main building is raised on decking and offers expansive views over the surrounding floodplains. The structure has been built into the existing tree line, its main support being a large Sausage tree. Guest accommodation consists of 8 classic styled safari tents. The delicately appointed tents exude classic Africa; handcrafted beds dressed with the finest linen, antique furniture individually selected and oriental carpets that transport you to early 19th century Africa. Stanley's Camp is carefully blended into the existing tree line and is set in a beautiful location. All tents are 450 metres apart. Malaria is a serious concern in northern Botswana. Please consult your doctor for the best prophylaxis. Bottled mineral water is supplied by the camp. Children under 9 years are not accepted unless by prior arrangement, as the camp is unfenced.